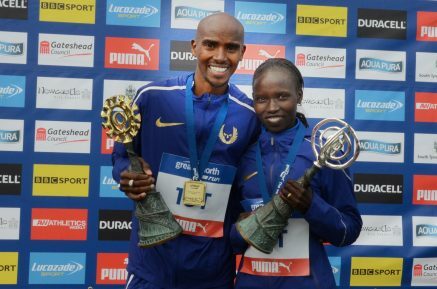 11th September 2016 – Olympic Champions Mo Farah (GBR) and Vivian Cheruiyot (KEN) ended their highly successful seasons in the perfect way with victories at the Great North Run. For Mo, this was his third successive victory at the event, making him the first man to ever achieve that feat. It was far from easy though, as Dathan Ritzenhein (USA) made much of the running and as a result it was an honest race from the start. Very quickly a lead group that also contained fellow PACE athletes Emmanuel Bett (KEN), Duncan Maiyo (KEN) and Chris Thompson (GBR) broke away but when 10k was passed in 28:30 this group was just three with only Emmanuel able to hang with Dathan and Mo. In the closing mile Mo was finally able to break away in a style which has been seen so many times before but is still nevertheless impressive to cross the line just outside the hour mark in 60:04. Emmanuel held on for third in 61:22, Duncan fifth (62:06) and Chris seventh (63:35). After a more sedate start in the women’s race, a similar pattern unfolded as a leading trio containing Vivian, former Olympic Champion Tirunesh Dibaba, and former winner of this race Priscah Jeptoo broke away. Dibaba was the first to fall back but Vivian and Priscah ran stride for stride well into the final mile. Once again, it was the finishing speed that Vivian has used so effectively before that brought her home in first place in a time of 67:54. This was the perfect way for Vivian to not only end her season, but also to make her debut at the half marathon distance, and finally to celebrate her birthday as she turned 33 years of age. The previous day at the Great North City Games, Tom Lancashire (GBR), Michael Rimmer (GBR) and Steph Twell (GBR) all competed in the road mile event. Tom and Michael placed fourth and tenth respectively in the men’s event and Steph took sixth in the women’s.